Shade coffee plantation in Finca El Jaguar in Nicaragua. Image © Cagan Sekercioglu. In Winged Sentinels we highlight the importance of improving bird habitat outside protected areas to help bird populations adapt to climate change. Bird-friendly coffee plantations are one fascinating way to achieve this. In human-altered landscapes, they can provide hospitable habitat to help birds shift their ranges. This allows their populations to track suitable climate conditions, prey, plants and other resources in flux under climate warming. 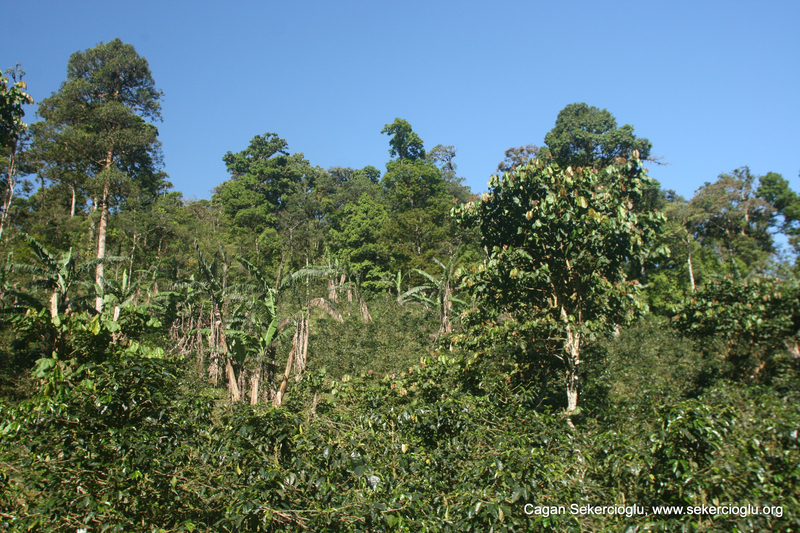 In these so-called shade plantations, coffee grows beneath multiple layers of shade trees and bushes. The result is a tastier cup of coffee, since coffee beans grown in shade mature more slowly, developing a richer flavour. But these plantations also provide birds with nectar, insects and high quality habitat, and may harbour bird diversity almost as high as native forests — and far greater than sun plantations, which are coffee monocultures with only a single layer of plants, making for poor bird habitat. The forest overstories of shade plantations also create microclimates, and provide corridors for migratory birds. Trees improve water quality and reduce topsoil erosion, and coffee farmers’ crops benefit from the insect-eating birds they harbour. These plantations also bolster forest growth in a way that increases their capacity to absorb the carbon dioxide that is fuelling global warming. Results of a three-year study published earlier this year by Cagan Sekercioglu and his PhD student Evan Buechley reveal that coffee plantations in Ethiopia are the most bird friendly shade plantations studied so far. They host relatively more forest bird species than any other coffee plantations in the world. Coffee originated in Ethiopia, where it has been grown in traditional shade plantations for a thousand years or more.“It is grown where it belongs in its native habitat with native tree cover and without chemicals,” says Cagan. All 19 bird species living closer to the ground in the “understory” of forests also were found in nearby shade coffee farms in Ethiopia. Ethiopian plantations may be better for birds because they contain native trees, instead of the exotic trees many other shade plantations use. “But coffee plantations are not better than forest,” said Cagan. Understory forest specialists – especially insect-eating birds of the forest understory – were found in much lower numbers in shade coffee. So although shade plantations are better than sun coffee plantations, only intact forests can guard against the extinction of forest specialist birds. Given the boost these plantations provide to birds in a warming world, let’s hope Ethiopian shade coffee is certified by the Smithsonian Bird Center or Rainforest Alliance sometime soon. With this “bird friendly” certification, growers can recoup a premium paid by coffee drinkers who are willing to spend a little more for this environmentally friendly product. So amazing to learn that there are some coffee species which are bird-friendly and others aren’t. I have always praised the idea of growing coffee naturally because the end result is nothing to be compared with. Birds and insects like bees also help in pollination which ensures a higher yield, so I have all the reasons to believe that these kind of coffee forests should be the focus to farmers, other than using chemicals which lower the quality (imo).